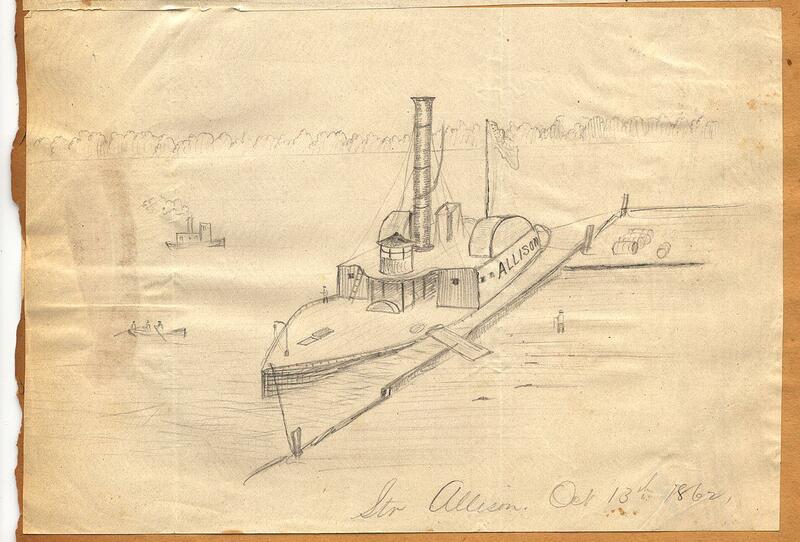 Item description: Drawing, dated 13 October 1862, of Steamer Allison, drawn by Herbert E. Valentine, a private in Company F of the 23rd Massachusetts Volunteers, who served in the United States Army between 1861 and 1864 in eastern Virginia, North Carolina, and South Carolina. Valentine enlisted in the United States Army on 5 October 1861, at Salem. On 18 October 1861, he was mustered into Company F, 23rd Regiment, Massachusetts Volunteers at Lynfield. Valentine served as a clerk and occasionally drew military maps. His artwork presumably was not produced for official purposes. In January 1864, Valentine was serving at Getty’s Station near Portsmouth. In May 1864, Valentine’s regiment sailed up the James River to City Point and took part in the siege of Petersburg. Valentine did not re enlist at the expiration of his service and was discharged from the army on 16 October 1864. He married, had one son and one daughter, and spent the remainder of his life in West Somerville, Mass., occupation unknown, where he died on 17 June 1917. Valentine was active in veterans organizations, and in 1896 he published Story of Company F, 23d Massachusetts Volunteers in the War For The Union 1861-1865. Item citation: From the Herbert E. Valentine Papers #4397, Southern Historical Collection, The Wilson Library, University of North Carolina at Chapel Hill. This entry was posted in Southern Historical Collection and tagged Herbert Valentine, Union soldiers, United States Navy. Bookmark the permalink.